As the 1936 baseball season approached, eager Milwaukee baseball fans could turn to the Sunday edition of the Milwaukee Journal to see what their Brewers were up to, and to get a peek into Spring Training with a nice color photo. This picture was published in the Journal eighty years ago yesterday, on Sunday, April 5, 1936. It shows the Brewers having a little fun at their Spring Training camp. Good to see the boys weren't all taking themselves so seriously. 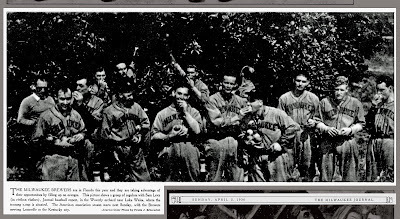 The Journal's color photo section continues to be an amazing window into Milwaukee Brewers history. Even the photos we can only access through library archives, photocopied and scanned and stripped of their color, carry a unique power. I only hope an original turns up one day.